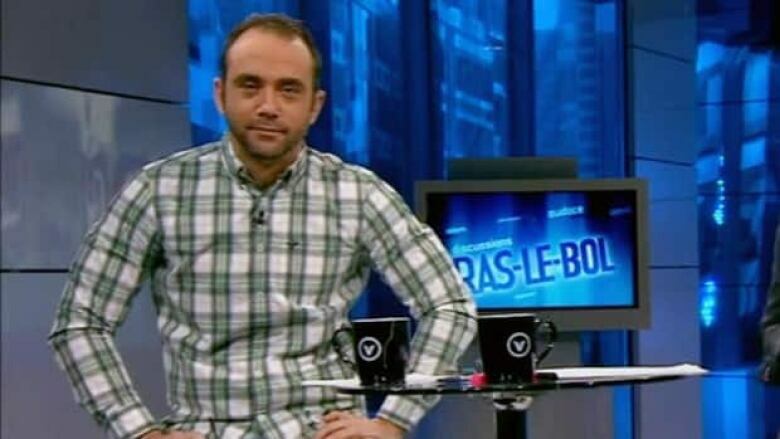 The Canadian Broadcast Standards Council is investigating after a Quebec mayor and talk show host said on the air that Israel doesn't deserve to exist. The Canadian Broadcast Standards Council is investigating after a Quebec mayor called Israel an apartheid regime and a country that doesn’t deserve to exist on his French-language talk show. Stéphane Gendron, host of Face à Face on V Television Network and mayor of Huntingdon, a small town 75 kilometres southwest of Montreal, made the comments on his show last month. He also said he supports a boycott of a store in Montreal that sells Israeli-made shoes. Gendron declined to comment when contacted by the CBC, directing all questions to the network. V Network spokeswoman Diane Patenaude said the point of Gendron's show is to provide strong opinions: "This program is neither a news telecast or a news magazine and its hosts are not journalists." The network will meet with Gendron and the show in the next few days to discuss the situation, she said. The CBSC has already received six complaints from Jewish rights groups over Gendron’s comments. "Political debate about religious issues is a fundamental part of our society — so long as that debate is done in a respectful way," said John MacNab, executive director of the CBSC. "So I expect that generally it's OK. It’s only where a comment becomes abusive or unduly discriminatory that we have a problem." He said if the council does find a problem with Gendron's comments, it would be up to the host's employers to rectify the situation. Michelle Whiteman of Honest Reporting Canada, an organization that monitors media coverage of Israel, said Gendron's public position makes his opinions particularly troubling. "He's been given a responsible position as a television host of a morning show in Quebec, so people look to him as someone who has a certain amount of authority … and knowledge," she said. Her group is calling for Gendron to be fired and for the network to apologize.